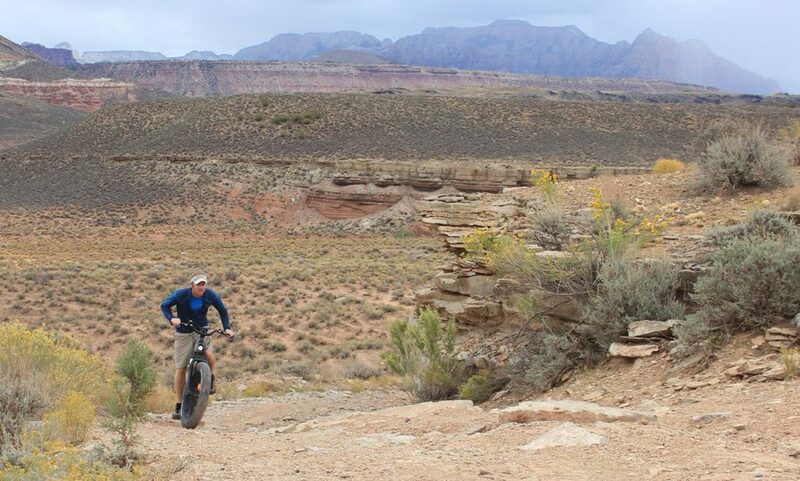 Experience Zion National park and other spectacular areas with Electric Bikes! E-Bike trips are accessible to everyone, and thanks to the pedal assist, we can explore 15 to 35 miles in a matter of a few hours. Blaze through vistas of unique and rarely visited terrain. We offer non- technical, beautifully scenic rides on paved paths and roads, alongside more technical off road, double and single track rides. Stop by our shop in Hurricane UT. for a free demo & information. Trips change with the seasons, but the essentials are the same. Bring plenty of water for the time of year. You'll need more than you think in the summer months. Snacks are a necessity, as any rigorous activity will drain your reserves. Layering is the way to go for clothes; tee shirts and light long sleeves in the summer, and sweaters, coats and long pants in the other seasons. The ideal footwear for rock surfaces are light-weight hiking shoes called "approach" shoes. You can find them in all outdoor oriented shoe stores. Small to medium size backpacks are a necessity for most of our trips. If you need to borrow a pack from us, we will happily oblige. Let us know when filling out your registration form.